An artist from Regina, Saskatchewan, Canada, is looking to shed the stereotype that cat hair is a nuisance. 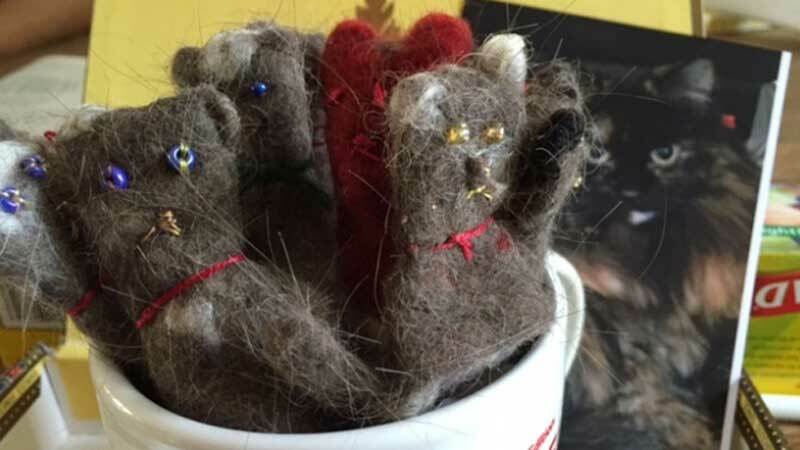 Instead of throwing it away, she's collecting it to create tiny works of felt art in the form of cat finger puppets. Gerda Osteneck said she got the idea for felting with cat hair from her own feline friend after taking a felting class. 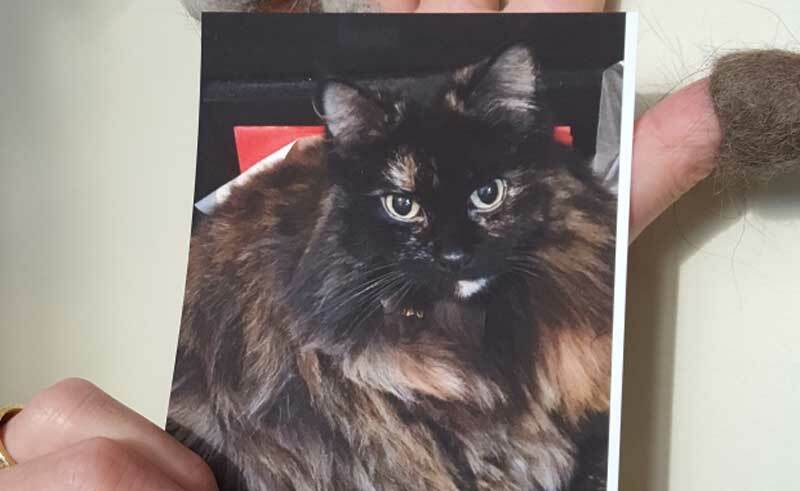 "Boo was a rescue cat we got shortly after I took a felting class, and I took one look at her 'Oh, I want to felt you.'" Osteneck started brushing Boo regularly and saving the hair. Then she came across a book about felting cat hair and found out she wasn't the first to have the idea. "I just laughed and walked away. But then after the amount of the hair that I collected from Boo, I got the book." She explained that the process for felting cat hair is the same as felting with wool. First a pattern is made out of a heavy plastic. Then the hair is wrapped around the plastic, and soapy water is applied. The next step is to massage it all together, causing the hair to become felt. Nowadays, Osteneck says all the cat hair she collects goes straight into a plastic bag to save instead of the trash can. 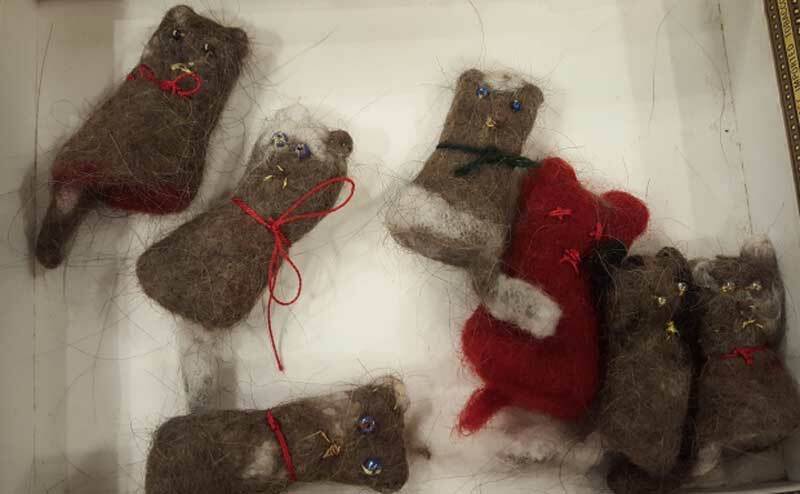 After she collects enough brown and grey hair from Boo, she makes the felt and then crafts it into tiny finger puppets. Osteneck is now itching to show others how it's all done. 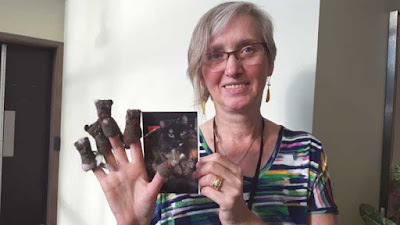 Later this year, she's teaching a class on cat hair felting for 12 to 15-year-olds at the Neil Balkwill Civic Arts Centre. "This is the first time I've posted a class for it and I'm really quite surprised at the reaction," she said. Aside from learning how to make the felt, Osteneck hopes her students take away a sense of humour and openness about what makes art. "You don't have to go out and buy a kit. You don't have to go out and fill a studio full of equipment," she said. "You can just grab your cat and brush, and the next thing you know you've got enough materials to make something." While her art is restricted to cat hair right now, she said she's willing to give dog fur a try in the future too. "Haven't tried it yet, but I've got a few people who've said they'd be more than happy to provide me with dog hair."